As May Day approaches, the International Workers Association would like to express our solidarity to workers in struggle across the globe and to those fighting for a more horizontal economic and social order throughout the world. 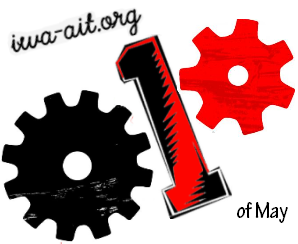 We would like to remind all of the meaning of May Day and the significance of the ideas behind the revolutionary workers' international – the IWA. During the 1880s, workers and unionists like ourselves fought for the right to an 8-hour working day. They were violently repressed by the state and some of our comrades gave their lives for this struggle. Almost a century and a half later, many of us are still in the struggle for the 8-hour working day. The capitalists who exploit working people to collect their riches and usurp their power still work people beyond limits, especially in the poor countries of the world where they labor all day for their miserable existence. Often aided by the state, the capitalists may exploit and offer outrageously poor conditions which workers are driven into out of desperation. The world's working class is thus divided in relation to their access to the fruits of their labor, a world of more and less priveleged humans, with some workers clinging onto the lower rung for their survival. However, our struggle is a common one: to rid the world of this unjust and hierarchical social and economic struggle and to set about creating a world of truly equals. The question of social solidarity needs to take center stage on an international level. The capitalist system has distorted the economics of the planet. Many (but not all) people of some countries enjoy much higher standards of living because others are plundered and forced to work for starvation wages, relegated to a life of poverty. While poverty is a general outcome of the capitalist system, the scale of misery found in many of the most exploited regions of the world goes far beyond what most people encounter in some other places. This creates a deep economic rift, which is often combined with other lacks of advantage to make the struggle much more difficult. While there are fighting unions and anarchosyndicalist organizations in many different places around the world, we find that there is a huge gap ranging in everything from traditions to resources to help build our movements. The International Workers' Association was born of the idea of revolutionary internationalism. Its founders realized that we may all come from different circumstances, but as workers, we are equals. The IWA was formed on these principles and every organization in it is equal – regardless of what stage of development it is on. Because our struggle is a common one and our interests are all the same. We cannot make the revolutionary struggle right while maintaining priveleged situations created by the capitalist order. We can only begin this struggle when we destroy all vestiges of capitalism and accumulation in our heads and go forward as a federation bound by the same objectives and ideals. In this day and age, the workers' movements of many countries are held hostage to the realities they were born into. It is extremely difficult for many to carry out even simple organizational activity, not only in situations of repression, but in extreme social isolation and despair. As an international organization, on May Day we call on comrades around the world to remember the struggles and situations of those around the planet who would like to start and develop revolutionary workers' organizations such as our own. We call on all comrades to think more about international solidarity and to take actions and decisions in accordance with our internationalist traditions. The revolution cannot happen in isolation, at least not OUR REVOLUTION.